A while back, I went with my parents to a fabulous Italian restaurant. We were starving, and as we waited for our food, we stuffed our faces with these fabulous rosemary and olive oil flat bread crackers. They were super thin and super yummy. Since then, I have been wanting to recreate these great crackers at home – both with and without the gluten. Today, I am sharing with you a gluten free rosemary cracker, that while not as thin as the cracker from the restaurant, the rosemary flavor in these crackers, combined with the sea salt and olive oil, give me the flavor and crunch that I’m looking for. In the bowl of a food processor, process the brown rice. It should be mushy. Slowly add in the rest of the ingredients while pulsing. Process until it forms a ball and moves away from the sides of the bowl. Dust a flat surface with some more garbanzo flour. Knead a bit for a minute. The dough will be a bit sticky. Place half of the dough on a piece of parchment paper that is sized to a baking sheet. Roll out the dough as thin as possible on to the parchment paper. It’s important that you roll it thin so it can achieve ideal crispiness. Try for around 1/8 inch. Brush the dough with olive oil and sprinkle on some sea salt and more rosemary sprigs. Cut dough with a pizza cutter to preferred crackers shapes/sizes. Repeat with the other half of the dough. Bake in oven for around 25 minutes. Check periodically for browning. The crackers should be browner around the edges and browned a little on the bottom of the crackers. They will harden more once you let them cool down a bit. I have made crackers a few times. Those Mary’s Gone Crackers copycats were big hit in my house. This time, I was looking for something with a similar crunch, but a bit different flavor – perhaps a little less nutty. I wanted something similar to those packages of Japanese senbei crackers I get at Whole Foods, or perhaps the sesame rice rounds I get at Trader Joe’s. I wanted a cracker that met somewhere in the middle. I definitely wanted to keep it gluten free, but with a good crunch. I also didn’t want to have to run out and buy too many new ingredients. These crackers fit the bill. I had everything on hand. Definitely happy with the way they turned out and will make again – perhaps with a few flavor tweaks. These crackers are great with tapenade or hummus, or anything you would pair with a chip or cracker! Mix everything together in a mixing bowl. The dough shouldn’t be too sticky and should come together. You can add a little more rice flour if it seems too sticky and wet. Let the mixture sit for five minutes. Spray a large baking sheet. Pull of little teaspoon size pieces of dough and roll in to balls. Similar to my previous cracker recipe, take a small square of oil sprayed parchment paper and press the ball on to the pan. You can use your hands, or you could use a heavy glass. You want the cracker dough to be very thin, but you don’t want it to rip. Even if it rips though, it’s still tasty. The crackers do shrink a little in the oven – so it’s ok if your dough rounds are touching. P.S. Don’t forget to enter the giveaway for Tribes-a-Dozen’s Voila! Hallah! I’ve become a gluten free guinea pig. Scouring the web, bookstores, and brainstorming new ideas for gluten free meals and snacks. The main meals aren’t too complicated. Dinners have only needed minor tweaking to adapt to gluten free. The hardest area has been snack food. We aren’t a big cake/cookie family – but the kids likes her crunchy stuff. Pretzel sticks have always been a mainstay in her feeding therapies. There’s only so much popcorn one can handle. Store-bought snacks are not cheap. Coupons are hard to come by for the kinds of foods we are looking for. So I am trying to make my own. When we first began our gluten free adventure, I asked a friend for pretzel ideas. She mentioned the Sticks & Twigs by Mary’s Gone Crackers. I’ve quickly become addicted to these gluten free pretzels. They aren’t like ordinary pretzels. They are full of seeds and stuff. They have a great crunch. They have a nice, nutty flavor. More involved than a standard Snyder’s pretzel. Unfortunately, at $4.50 a bag – they don’t fit my budget too well. Looking at the ingredient label, I pondered trying to make my own. The ingredients aren’t too complicated; brown rice, quinoa, flax seeds, chia seeds, sesame seeds, and tamari. I have these ingredients in my pantry. While googling for ideas, I came upon the crackers of Mary’s Gone Crackers fame. They are basically the same pretzel taste in a cracker. I figured that I would tackle that first – and then I could move on to pretzels. 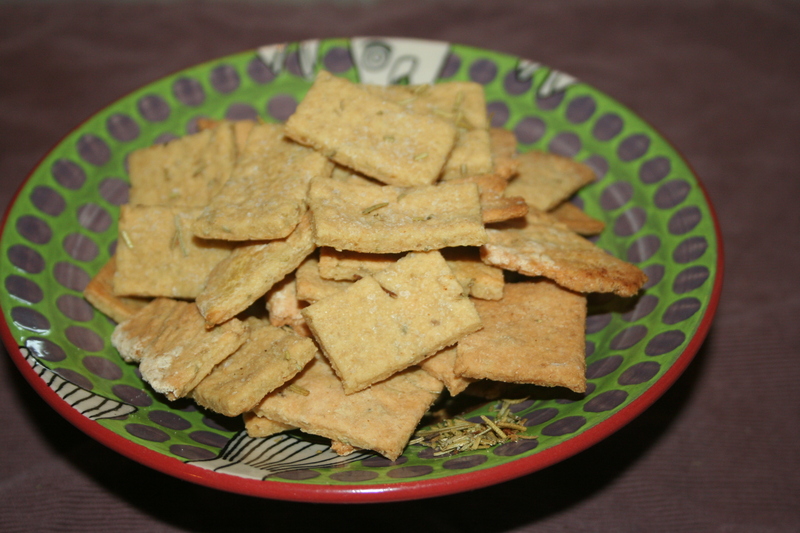 The first time I made the crackers – my results were uneven. Some pans came out ok, and some pans came out – well, not so ok. By the second time – I finally got it down pat. Similar to the pretzels, the crackers cost around $4.50 for way too few crackers. Happy to get about 3 times as many crackers at a significant savings by making my own. I do plan on playing with the recipe more to add flavors – like garlic and rosemary. 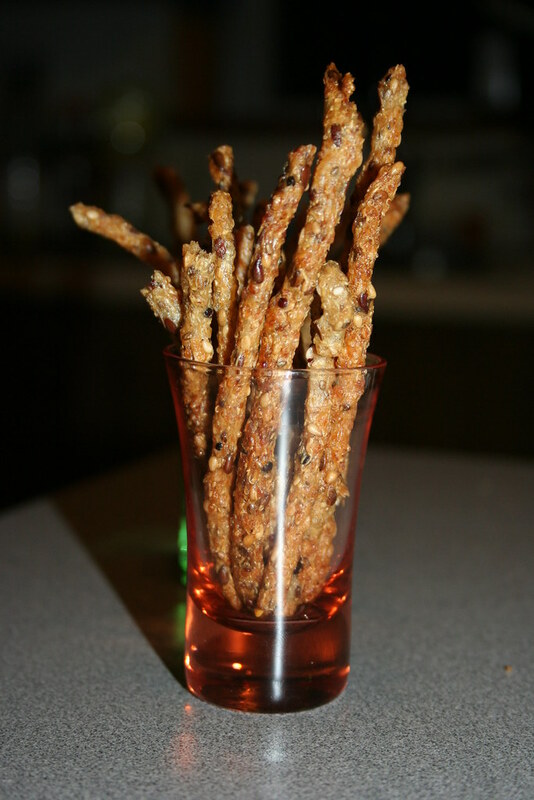 I am still determined to figure out how to make the pretzels – in the meantime, enjoy these yummy crackers! This recipe was slightly adapted from here. Prepare rice and quinoa as per your regular methods. Add cooked brown rice to Cuisinart and process with a small amount of water. You should process brown rice to a mush. Add quinoa to the mix and process a bit more to incorporate. Add the tamari or soy sauce and mix a bit more. Take the dough out and place in bowl. Mix in other seeds and seasonings with a wooden spoon. The mixture will be very sticky. Spray baking pan with oil spray or rub olive oil on baking sheet. Do not use parchment paper. Drop teaspoon size bits of dough on to cookie sheet. On a half sheet pan, I got around 16 balls. Take a small piece of parchment paper, spray lightly with oil and place on top of each ball and flatten. I pressed down on to the paper with a stainless steel measuring cup. It seemed to work best. The cracker should be very thin and flat. Bake at 350 degrees. Keep an eye on the crackers. Remove them when they have browned and are comepletly dry. Don't let them burn. I took them out at around 17 minutes. Keep an eye out. Different pans conduct heat differently. P.S. As a follow-up, I did succeed in making the pretzels. You can check out the pretzel recipe here!